Trastevere is perhaps the most famous area in the city of Rome, retaining its medieval feel and heritage, the area of Trastevere is a maze of cobbled streets, restaurants and bars. Bustling and with a lively and romantic atmosphere, the area is dominated by the beautiful 4th century Basilica of Santa Maria in Trastevere. Boasting breath taking mosaics and a lavish yet simple interior, the square in front of this ancient church dedicated to Our Lady, is a favourite meeting spot for locals and tourists alike who enjoy sitting on the steps of the central fountain watching the people meander by. YHExclusive® accommodations are located close to this beautiful spot and also within walking distance of the main attractions of the Eternal City. By crossing the river over the famous Ponte Sisto, or across the picturesque island in the centre of the River Tiber that holds the bodily relics of the apostle, St Bartholomew, guests are within walking distance of the market and bars of Campo de Fiori, or the Jewish Ghetto. To the north of Trastevere and within walking distance is the Vatican – home not only to the Pope, but also to the awe inspiring Basilica of St Peter, the Vatican Museums and the Sistine Chapel. 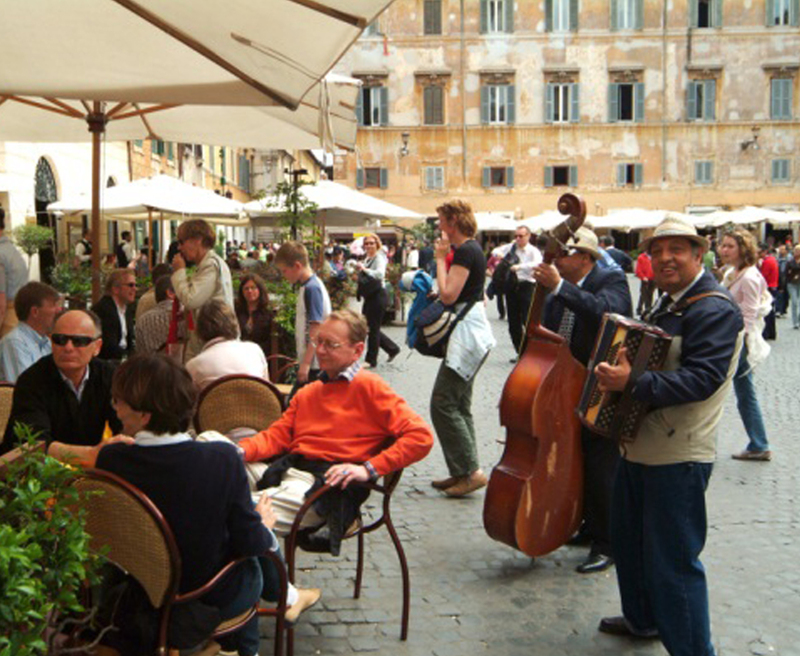 To the south guests can walk to the famous Sunday market of Porta Portuense or venture into the Testaccio district of Rome famous for its traditional Roman cuisine and nightclubs at the weekend. Our accommodation also lies on a major tram route that can take guests to Largo Argentina, and Piazza Venezia where the shopping district begins and from where guests are just a few minutes walk from the Capitoline Museums, the Imperial Roman Forum and the ancient Coliseum. We are also conveniently positioned close to Trastevere railway station which offers direct links to Fiumicino Airport and Termini Station – the transport hub of Rome. So what are you waiting for? Make your booking today before all of our places are snapped up and by using our real time online booking system, you can also take advantage of our lowest possible prices.